Known and practiced world-wide, judo is the sport that uses throws, grappling pins, chokes, and armlocks to overcome opponents. Learning and practicing judo provides all levels of exercise, cardiovascular conditioning, physical coordination and balance, self-defence, and even competition path all the way to international and Olympic levels. It’s that rare physical activity that can easily be practiced by the whole family, with each member advancing at their own pace and skill level. Judo is also a great way to teach self-discipline and respect for others, while improving one’s self-confidence and control. And perhaps best of all, judo can easily be practiced from pre-school all the way into advanced age! Judo is a thinking sport, with strategy in every step and movement, guided by the principle of maximum efficiency and minimum effort. The word Judo consists of two Japanese characters, “Ju” which means gentle and “do” which means “the way”. So Judo means the way of gentleness. Judo is a dynamic sport that does not rely on strength but is based on a combination of balance, co-ordination and reaction – all skills that help performance across other sports. Judo is essentially a defensive sport involving two players, each of whom uses specific techniques and quick reflexes, plus balance, power and movement to get the other partner off-balance and take them down onto the mat. The place where judo training occurs is called a ‘dojo’, which literally means a ‘place to learn the way’. The traditional dojo is floored with mats called ‘tatami’. Judo players wear a special outfit called a ‘judogi’. The judogi is made of heavy cotton material, and consists of a jacket, trousers and a belt. The colour of the belt signifies the ‘grade’ or the experience of the player. Judo is a rigorous and demanding physical activity. The practice of judo techniques helps people develop basic and fundamental physical fitness in a number of ways, such as the development of strength, flexibility, agility, speed, dynamic and static balance, explosive power, and endurance. The practice of active attack and defence helps develop reaction time, coordination, and overall physical self-confidence. 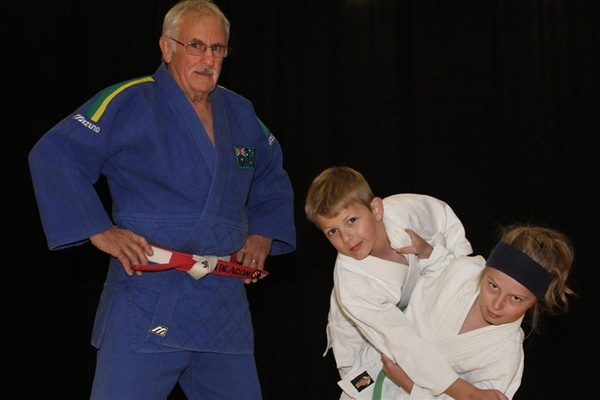 Judo students become physically bigger, stronger, and faster through their practice of judo. Not only does judo produce tremendous gains in overall physical and athletic ability; judo students learn the specific skills and techniques of judo. They learn a variety of techniques in order to throw their opponents to the ground with force, speed, and control. While judo students are often exposed to many of these types of throwing techniques in their judo careers, they usually master only a handful, and a handful is generally all that is needed to be successful in contemporary judo competitions. Judo students also learn the fundamental principles and the dynamics of subduing their opponents on the ground through the application of pinning and submission techniques. Their prowess both on the ground and on their feet, combined with the considerable basic physical fitness gained from daily judo practice, affords judo students with a considerable repertoire of techniques, skills, knowledge, and abilities. These, in turn, allow them to be excellent athletes, with a sound physical base of fundamental skills, and formidable and imposing opponents in competition. Judo is much more than the mere learning and application of combat techniques. In its totality, it is a wonderful system of physical, intellectual, and moral education. Judo has its own culture, systems, heritage, customs, and traditions. Moreover, the principles of gentleness are carried from the practice mats and into most students’ lives, in their interactions with their friends, family, work colleagues, and even strangers. Judo gives its students a code of ethics, a way of living, and a way of being. Practiced today by more than 20 millions of individuals, judo is undoubtedly the most popular combat sport in the world. In terms of sheer numbers of participants, judo is the second most popular sport of any sport, soccer being number one. In terms of national organisations worldwide, judo is the largest sport in the world, with the greatest number of member nations in the International Judo Federation, or IJF. It is a part of the physical education systems of many countries, and practiced in local clubs, junior high and high schools, colleges, regional and national training centres, and in many other areas in this country and across the world. Millions have discovered the spectacular enriching sport, and way of life, we know of as judo.